KOMBUCHA—a replacement for Pepsi and Coke? It's not likely that Kombucha will replace the two current leaders for fizzy drinks. We Americans are too set in our ways when it comes to our fizzy water and we are almost equally divided into two camps when it comes to caramel-colored carbonated sugar water. It’s remindful of our approach to politics. During the recent presidential election many of my friends complained to me that neither candidate was acceptable. “It’s too bad we don’t have other choices on the ballot.” The fact was that just like with Pepsi and Coke, we did have other choices on our ballot for president: A libertarian candidate and a Green Party candidate, not to mention independents and several write-ins. In a democratic society it’s up to the people to create the change. Kombucha, due to our national proclivity to only expose our palates to the familiar, is highly unlikely to become competitive with the established brands for carbonated sugar water. No doubt the two major soft drink corporations will be able to maintain their gigantic market share. Still it is interesting to learn more about what Kombucha offers us. When I was in Southern California over the summer, I bought my first bottle of Kombucha and tried it. I thought it was great. It reminds me of the energy drinks that a lot of folks are addicted to—although I’m told Kombucha is far healthier for you. Kombucha is a fermented tea and the taste depends on what the person who made it flavored it with. For example, if it is flavored with apples and cinnamon, it will taste like sparkling cider. If it is flavored with lemon or orange zest, then it will have a citrus flavor. The possibilities for flavor are almost endless. Kombucha contains probiotics and antioxidants. It also appears to have strong antibacterial properties against infection-causing bacteria. One of the main substances produced during the fermentation of Kombucha is acetic acid which is also abundant in vinegar. Acetic acid is able to kill many potentially harmful microorganisms. CAUTION: if you or someone in your family is an alcoholic, you may want to consider purchasing Kombucha in the store as homemade Kombucha may contain up to 3% alcohol. Commercial products are good and considered alcohol-free, as they must contain less than 0.5% alcohol. Avoid brands that are high in added sugar. At a recent Loving Garland Green meeting, one of our board officers, Anita Opel, provided a demonstration of how to make Kombucha. I now have a gallon pot brewing in my kitchen. As with any food preparation such as canning in the home, caution is strongly advised when making your own Kombucha. Using clean utensils is one of the top priorities. One of the best ways to know if Kombucha is good is to taste it. If it doesn’t taste good, or if it smells bad, or if mold is on the SCOBY—THROW IT OUT. Still, at an average price of about $4.00 for eight ounces in the grocery store, you may want to consider making your own Kombucha in case you find that you have a taste for it. Although sugar is an ingredient, the sugar is consumed by the culture leaving a delicious tart drink—thus Kombucha is ideal for diabetics. SCOBY is actually an acronym: Symbiotic Culture Of Bacteria and Yeast. SCOBY is the name of the starter for Kombucha. Like all fermented foods, such as sourdough bread, a starter is needed to begin the process. This rubbery blob is a mix of cultures of bacteria and yeast present during production of Kombucha. At the end of this process, you will have created another SCOBY. Make sure to keep this—along with one cup of the Kombucha you’ve made—to use as the starter for your next batch. You will need to keep it in your fridge until you are ready to use it to make a batch of Kombucha. A SCOBY is constantly renewing itself and a new layer of SCOBY will grow on the surface of the old one every time you brew a batch of Kombucha. As for the Mother SCOBY: There is no limit to the number of brews you can get. Some say they have used the same mother for months of continuous brewing. 1. Bring the filtered water to a boil in a large pot over medium high heat. 2. When the water has reached a rolling boil, add the sugar and continue to boil for 5 minutes. 3. Turn off the heat and add the tea bags. Steep for 10 to 15 minutes, then remove the tea bags, and let the tea cool to room temperature. 4. Pour the cool tea into the 1-gallon container. 5. Add the SCOBY, placing it so that the smooth shiny surface faces up. 6. Add the fermented Kombucha tea. 8. Let the covered container sit undisturbed in a well-ventilated and dark place at a room temperature between 65° and 90°F for 6 to 15 days. 9. Taste test every couple of days, starting on the fourth day. The tea should be tart, not sweet. However, it should not be overly sour or vinegary. If the tea is sweet, the sugar hasn’t been fully converted. If it tastes like sparkling apple cider, it is ready to drink, unless you want it more tart. If the vinegar taste becomes too prominent, it’s probably fermented a bit too long. It won’t hurt you to drink at this point, but provide as many health benefits because the healthy bacteria die off over time, since the food supply is constantly being reduced. 10, When the tea is brewed to your taste, pour it into glass bottles, cap them, and then place the bottles in the refrigerator where the tea can be stored for one year or longer. It will eventually turn to vinegar, which you can use as you would any vinegar. The finished Kombucha can also be second fermented with various juices but it’s also delicious as is. This process enables the brewer to add different flavors to the basic Kombucha mix. These flavor additions range from fruit juices to coffee and various recipes can be found on the Internet. Some folks even add bits of fruit such as apple--but I'm not fond of stuff floating in my drink so I won't be doing that. 1. Six, one-pint bottles with swing-tops that clamp down. You can repurpose beer bottles with swing tops such as those from Grolsch, or you can buy new glass bottles that are specifically designed for brewing. 2. Add 1 to 2 ounces of fruit juice per 12 to 13 ounces of Kombucha, leaving a little headspace at the top of each bottle. 3. Clamp the caps closed. Let the bottles sit in a dark place for 1 to 3 weeks. Note: Check the Kombucha every few days to make sure it is fizzy enough for you. Once the Kombucha meets your taste expectations, transfer the bottles to the refrigerator. Kombucha can be stored in the sealed bottles in the fridge for up to one year, but it will turn to vinegar over time. Also, once opened, the carbonation will start to decrease—just like regular store-bought soda. WHERE CAN YOU ACQUIRE A SCOBY AND A CUP OF KOMBUCHA? WHERE CAN YOU ACQUIRE MORE INFORMATION ON CULTURED FOODS? With International Soil Day just around the Corner on December 5, I thought I’d update Loving Garland Green’s activities relating to November Leaf Awareness month and also provide information regarding the state soil of Texas. Yesterday Charlie and I began building the “Compost Christmas Tree”. We have most of the cloth sides stapled to the frame. The cloth we are using is recycled green environmental cloth that we picked up free in May after the Byron Nelson Golf Classic. It was used during the event for temporary fencing. We added solar powered lights and will add more this week. In addition, we will put recycled tree ornaments on the tree. If the ornament is on a hook, it is easy to hook into the fabric. We invite the public to participate by bringing an ornament to add. We are leaving the bottom layer mostly open for children to add ornaments. Yes, we have a state bird, a state flower, a state insect and even state soil. 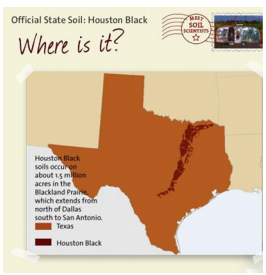 Our state soil, Houston Black, is found in the Blackland Prairie, an ecoregion that includes the DFW area. It stretches from the Red River to just south of San Antonio along Interstate 35. The Houston Black soil series is found only in Texas, and was first described in 1902, the third year of the National Soil Survey program, in Brazoria County. The Professional Soil Scientists Association of Texas chose Houston Black as the state soil of Texas. Every soil can be separated into three separate size fractions called sand, silt, and clay, which make up the soil texture. They are present in all soils in different proportions determine the character of the soil. In Houston Black soils, the texture is most commonly clay or silty clay. It is one of the highest agricultural producing soils in Texas, generating between $300 to $500 million in annual revenue. Houston Black also occurs in the area where millions of people live and work, including three of the largest metropolitan areas in Texas. When a soil cannot be used for one or more of the described functions, it is referred to as a limitation. Soil Scientists studied Houston Black soil and determined that it has moderate to severe limitations that affect the choice of plants that can be grown. While the soil and the landscape make the Blackland Prairie very fertile agriculturally; the high clay content causes the soil to be very hard when dry and very sticky when wet, and it tends to shrink when dry and swell when wet. These properties pose limitations to how the land is worked for farming and construction. There are special management issues associated with the soil due to its properties. For the urban gardeners who live and garden in the eco region of the Blackland Prairie, this means they need to manage the soil with amendments to make it more productive. Because the clay is so dense, it does not leave room for the roots to breathe and access the nutrients in the soil. By mixing expanded shale into the soil at about a foot deep, a gardener will permanently add the needed breathing room in the soil to grow just about anything. 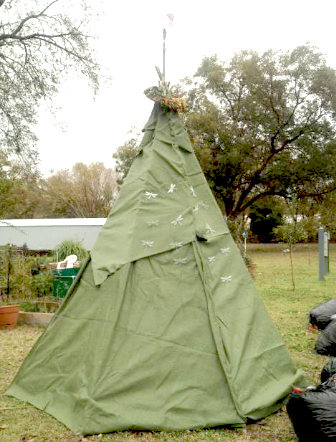 By putting this amended soil on top of a two-foot layer of rotten tree limbs, the Blackland Prairie gardener will have the perfect growing environment for just about any edible plant. The rotting tree limbs will hold water and release nutrients to the plants. Many claim that these beds (hugelkulturs) require no extra nutrients or water for up to twenty years. Houston Black also requires special management techniques for builders. Hydrated lime often is added to stabilize the clays, and also layers of crushed rock and gravel are added to stabilize roads and large buildings. Foundations of buildings also need to be reinforced with steel rods. The quality of soil is directly related to the availability and the quality of the food we eat. Soil, and organic soil amendments in particular, played a huge part –not only in the menu of the First Thanksgiving but also in the ultimate survival of the first white settlers to the USA. The first Thanksgiving in the USA took place in November 1621—just about a year after the Pilgrims landed in Mid-December of 1620 at what they would call Plymouth Harbor, on the western side of Cape Cod Bay. Accounts vary regarding the exact number of survivors that first winter, but all estimates are that about 50% of the original 102 English settlers died during that first winter, as a result of poor nutrition and housing that proved inadequate in the harsh weather. Venison – The Native American guest brought along five deer. Goose and Duck – Migratory geese and duck were plentiful in the area during fall. Turkey – In a 1621 letter, Bradford commented on the “great sotre of wild turkeys” that the colonist hunted. Beer – The Pilgrims liked beer which they brought with them on the Mayflower. The 1621 harvest had yielded a crop of barley, which made it possible for the colonists to make their own home brew. Cornbread – The colonists had just harvested their first corn crop. This was Indian corn which was dried and pounded into cornmeal for baking—the sweet corn that we eat today. Pumpkin – There were not pies but it’s likely they served stewed pumpkin or bread made from pumpkin and corn meal. Squash – This vegetable was likely either boiled or roasted. Without the Native Americans there likely would have been no vegetables at this first Thanksgiving—and without vegetables, more settlers would likely have died from scurvy. Soils in the coastal area of Plymouth Colony are shallow, sandy and stony. These coastal soils are not deep and sit on top of hard bedrock. The Native Americans in the area taught the colonists to plant fish in the ground with the kernels of corn and other seeds such as squash. This decaying organic matter enriched the poor soil and enabled them to grow healthy crops of vegetables. 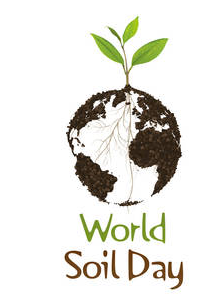 December 5 is coming up and I could probably be safe in saying that not one person reading this knows that December 5 is World Soil Day—a day designed by the International Union of Soil Sciences in 2002 to celebrate the importance of soil as a critical component of the natural system and as a vital contributor to human wellbeing. Soil, the thin layer that covers the earth’s surface like skin is an undervalued and endangered natural resource. According to soil expert Winfried Blum, worldwide only 12 percent of the land area is suitable for farming. That area is supposed to insure food security for 7.5 billion people. We are destroying soil at a rapid rate in the USA and Europe mostly with our unending quest for a tidy yard. Homeowners play a role in destroying our soil resources. For example, there is a trend in some areas to keep gardens small and put down stones or even pave the yard with concrete. This soil sealing prevents the ability of the earth to absorb water and eventually kills the microorganisms that live in the dirt underneath. Having leaves hauled off to a landfill is another activity that destroys soil. Essentially by removing leaves from an area you are removing future soil. Eventually, in order to continue to grow plants in that area, soil will have to be purchased and hauled in. Ideally leaves should be left where they fall to decompose and eventually make more soil. Landscape fabric is another way that urbanites interrupt the natural processes that take place in the soil. One of the creatures landscape fabric removes from the soil are earthworms. Earthworms come up to the surface periodically to eat compost and to breathe. If landscape fabric covers the surface, earthworms are not able to do this. Most of them in the area will die and others will move on to another space. Earthworms are there for us and the soil to aerate it and keep it loose and fluffy for the roots of living plants. If you’ve ever pulled up this landscape fabric you’ve probably noticed the soil is compacted and hard as a brick—that’s because that soil is essentially dead. “Ask a Soil Scientist” program. If you have any question on soils, soil science, and careers in soil science, this is the place to get answers. And, teachers, if you’d like to arrange for a soil scientist to visit your classroom, this is the place to make a request. Your question(s) will be sent to a Soil Science Society of America member, in your region. As our members are volunteers with this program, please allow 24-48 hours for a response. The Ask a Soil Scientist program has been designed for K-12 teachers, students, and anyone else with general interest soils-based questions. If you are a professional with a soil science question, consider an SSSA Membership - which will provide you access to the Membership and Scientific Expertise Directories. You may also wish to consult with a Certified Professional Soil Scientist. For research questions try searching our journals. 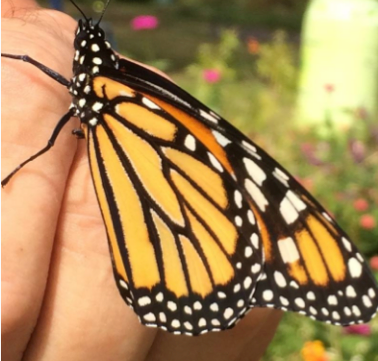 Big Day For Monarchs in My Neighborhood on Thursday! Just when I thought Monarch rescue was winding down for the season in my neighborhood, it suddenly cranked into overdrive yesterday: Three pupas eclosed into Monarch Butterflies. I tagged and then released them at about noon. That left me with two pupas. I didn’t even have time for the empty nest syndrome to set in. At about 2PM I got a call from my friend Margie to come over because she had found three Monarch caterpillars on some milkweed she was getting ready to cut back. I cleaned the laundry baskets from the previous inhabitants and went over to Margie’s to pick up the three new charges. As I was collecting them, Margie found two more for a total of five. Then we went across the street to my house to get some more milkweed from my garden and what do you think? While we were gathering milkweed for the hungry caterpillars at my house, we found five more. Now I have ten caterpillars and two pupas—12 more potential Monarch butterflies. Thus far this year Charlie and I have rescued and released 20 Monarch butterflies. However, we’ve only tagged nine of them. Tagging them is a delicate process that involves holding both their wings together and affixing a tiny label to the discal cell of the creature’s hind wing. We got the labels from a friend who didn’t have time this year to participate. 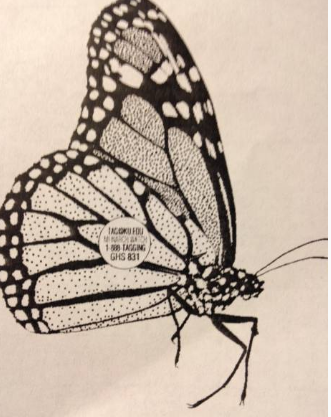 The labels come from Monarch Watch, a nonprofit education, conservation and research program based at the University of Kansas that focuses on the monarch butterfly, its habitat and its fall migration. 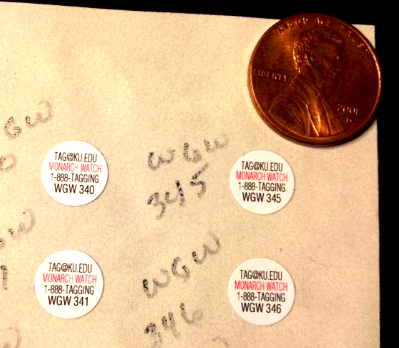 Each tiny, all-weather, adhesive-backed tag is imprinted with Monarch Watch’s phone number, email address, and a unique identifying number. If you find a tagged Monarch—dead or alive, please use that contact information and call Monarch Watch. I send this data to the University of Kansas at Lawrence Kansas. The majority of the recovered tags are obtained in Mexico. Each year members of the Monarch Watch team visit the overwintering sites (El Rosario and Sierra Chincua) where they purchase tags from guides and ejido members. Since the ratio of untagged to tagged monarchs is quite high, it takes most residents several hours to find each tag among the butterflies. They pay $5 for each tag. The recovery data is posted on the Monarch Watch recovery site and is analyzed to test hypotheses concerning monarch orientation and navigation. The data are also used to determine mortality during the migration and estimate the number of monarchs in the overwintering population. All the data to this point in time suggest this year will be a repeat of 2014 with a significant decline in the migration and overwintering numbers. The problem this year seems to be the low numbers of first generation monarchs moving north in May and early June. These numbers are quite similar to those reported in 2014. 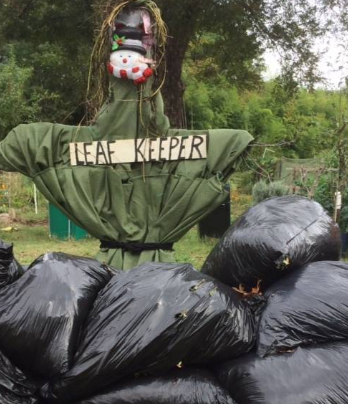 The current size of the leaf bag collection is 40 feet long, 4 feet high and five feet wide. It now contains 302 bags (9,060 pounds or about 4.5 tons). This morning we picked up and unloaded approximately 2,010 pounds of leaves. The sixty-seven bags picked up today came from Firewheel residential area for a total of approximately one ton of leaves since the bags average 30 pounds each. Consider, if we collect 1000 bags, the size would measure 130 feet long four feet high and five feet wide and weigh about 13 tons. That's a lot of room and a lot of leaves. However, if you consider that a conservative estimate for our city is not at 12 or 13 tons but rather at 12,000 tons of leaves, you will get the picture of all the leaves we are sending to our landfill. This is so wasteful and it costs us money as we are the ones who will have to replace the leaves (future soil) if we want to continue to grow plants in our yard. We will have to buy back the soil we are throwing away. 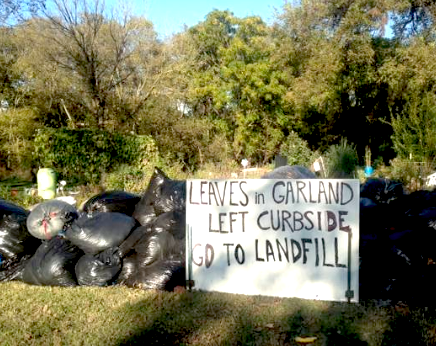 A lot of people in Garland still mistakenly think the bags of leaves they put curbside are picked up by Garland Environmental Services and mulched. We know because we’ve asked a lot of people. Bags of leaves left curbside in Garland are taken to the Hinton landfill where they are added to the landfill mass. This is not the best choice. The tree limbs and shrub trimmings left unwrapped on the curb in Garland are picked up and mulched and made available to the citizens. Perhaps this is where the confusion comes in. People just assume because the City picks up the tree branches and mulches them that they do the same with the bags of leaves. They do not. We love Garland. We also believe that people need to know the truth in order to make the best decisions—for themselves and for their community. In regard to leaves, the most environmentally responsible decision is to recycle the leaves where they fall—either by simply leaving them alone, or by composting them and then using the compost to enrich the soil in the yard by replacing the nutrients and minerals that were used to make the leaves. We are losing soil in our urban areas at an alarming rate. When you have your leaves hauled off—whether it is to a landfill or to a recycle center such as they have in Plano Texas with their Texas Pure Products—you will still at some point in time need to replace nutrients and soil by purchasing it. You will also broaden your ecological footprint by driving to the recycling center to pick up the soil (thus burning fuel for the trip and adding strain to the infrastructure and pollution to the air. I’m hoping to be able to construct it tomorrow, before the bad weather comes. We’ll see. Yes, there is a demand for Handmade in the USA! I recently visited a small business tucked away on 420 Gautney Street here in Garland Texas. Ribbit Ribbit creates handmade and uniquely crafted frames for their customers’ very special photos. Most of the photo frames made in this shop are sold wholesale to owners of small boutiques nationwide. 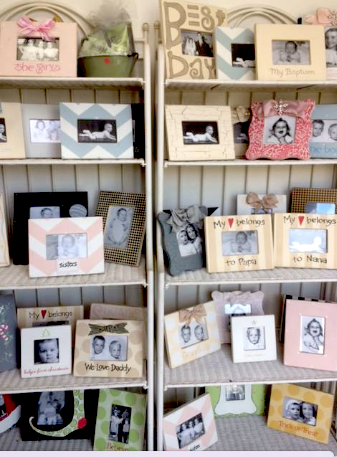 If you are a merchandiser looking for one-of-a-kind handmade in the USA products, it’s not too late to stock your store with photo frames from Ribbit Ribbit. 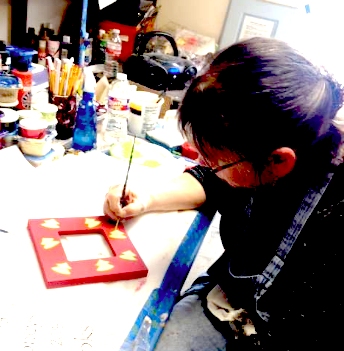 The Garland, Texas address shown in the photo above is where these frames are built, decorated and shipped out. It is also possible for individuals to select and order frames online at http://ribbit-ribbit.com. The business is owned by Bryan Roberts, a Garland resident who lives only a few miles away from his shop. This company has been in operation for 13 years. Considering the competition with the overseas manufacturers from places such as China and Sri Lanka,combined with the labor-intensive and artistic talent required for hand-decorating each frame, I am amazed at the ability of Ribbit Ribbit to continue to create their frames here in the USA and stay in business. Yet, it appears this small business has carved out a niche in the specialty frames market. They even sell wholesale to international customers in exotic places such as Bahrain. 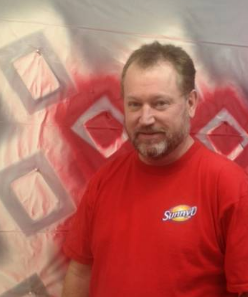 Bryan Roberts, owner of Ribbit Ribbit, poses in the room where frames are spay-painted as the first step in the process of creating a frame. Like many small business owners, Bryan Roberts finds himself wearing many hats to keep his company on track and moving forward—balancing the books, managing supply inventories, creating new designs, shipping the product out the door, and even working on the production line. But like most small business owners, he is happier being self-employed than he would be working as an employee. Ribbit Ribbit currently offers over 300 different designs of frames—and even more when you consider that any one of these designs can be customized and hand tailored to meet unique specifications per customer request. Small businesses like Ribbit Ribbit are critical to our nation’s economy as they employ 57% of the USA workforce (77 million people). These businesses are especially critical to the health of our local economy. When you buy local, more money stays in the community. The New Economics Foundation, an independent economic think tank based in London, compared what happens when people buy produce at a supermarket vs. a local farmer's market or community supported agriculture (CSA) program and found that twice the money stayed in the community when folks bought locally. 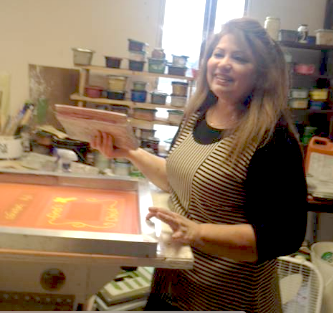 Lucia, one of the employees in the shop demonstrates her silk screening expertise while Jill, shown in the photo below, hand-paints touches to some holiday frames. Elizabeth Berry, Loving Garland Green President, in the center holds the Creativity for Community award for Watson. She is flanked on either side by two of the three teachers who assisted Watson’s second grade students in their participation in this event open to the community. 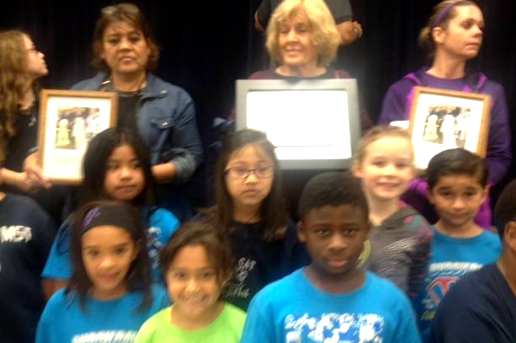 On Friday Loving Garland Green presented its first Creativity for Community Award. 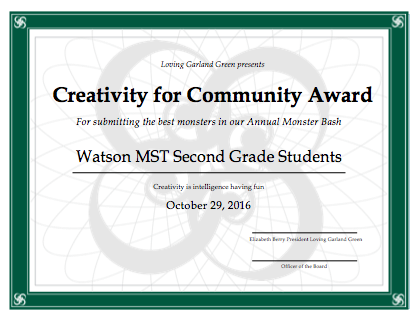 It went to Watson MST Second Grade Students for their participation in the first annual Monster Bash at the Garland Community Garden. The second graders were also awarded $100 as first prize for their three original entries in this event. The students will pass their monetary reward forward by using it to purchase gifts for children in the community this holiday season. Working together with others to create something entirely new is a great skill-building experience that can carry over to the student's life experiences as adults. Building things together is also fun—whether it is a monster, a community garden, a city plan or perhaps even a new medical device that can save lives. Working creatively together is a great skill to teach students. In doing so they also learn firsthand the value and importance of compromise and cooperation. Principal Chris Grey also participated in the ceremonies yesterday and honored the innovation and creativity of the Watson second grade students. The Creativity for Community Award will be displayed in the school's trophy case. Watson Technology Center for Math and Science offers access to innovative technology and a focus on math and science prepare students to be future leaders in emerging career fields. Project-Based Learning simulates the real world, with students working together to solve problems. Examples include: Water conservation, Sustainable good and services, and Cybersafety. Community connections also help make experiences more meaningful and extend instruction beyond the classroom. Students regularly collaborate with college students, CEOs, city officials and more. Named an Apple Distinguished Program, Watson provides true 21st-century environments. Students use MacBooks, iPads, iPods, robots, Arduinos, and Makey Makeys daily. The technology is used in projects such as; iBook Author, iMovie, GarageBand, Audacity, blogging and podcasting creations. Because of wireless Internet throughout the campus, learning takes place in hallways, outdoors, or wherever inspiration strikes. Members of Loving Garland Green have been supportive of the students and teachers at Watson almost since the very beginning of Loving Garland Green's Foundation. About two years ago Loving Garland Green hosted a tour of the Garland Community Garden that included the entire Watson second grade. In May of 2016 we worked with Watson teachers, parents and students to create a hugelkultur in their schoolyard garden. In addition to these activities, Loving Garland Green has donated olive trees and other plants for their garden and greenhouse. One of our members received a text from an “unknown” sender voicing superstitious fears about the “evil spirit” we had down at the garden. Since our “Leaf Keeper” is the only statue we have down there at the moment, I could only assume the author of the text message was expressing disapproval of the two by four pole with the green eco-fabric we had draped over it, and the glow-in-the-dark skull we had put on for a face along with potato vines for hair and twigs for hands and fingers. 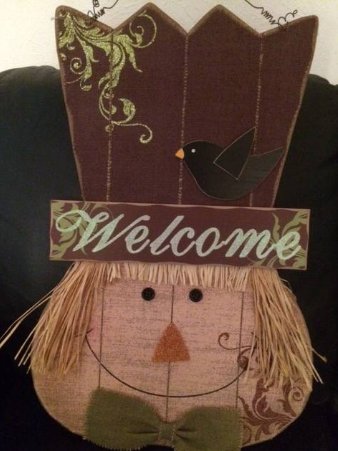 On Tuesday we modified the figure by adding the happy face of a snow person and we do have an identifying sign “Leaf Keeper” that we’ll add today so there will be no mistake. This figure is no “evil” thing. It represents a protector of our environment. Of course, perhaps there will be someone who will step up and claim that we have desecrated Frosty. In that event I have Pumpkin Harvest Man waiting in the wings. Leaf Awareness in Garland will likely expand from November 2016 through November 2017 and beyond as a continuing community education project. By the end of November 2016 we hope to have approximately 1000 bags of leaves down at the Garland Community Garden. We plan to empty the bags into a large mountain that will then be given a nitrogen boost to enhance the decomposition process and covered with green eco cloth. We estimate that two bags of leaves will equal about 15 pounds of compost. Thus we expect to end up with 500, 15-pound bags of compost. Pricing these bags at $5.00 each, which is the current average retail value, those leaves we collect will have a total market value of $7,500. Our little exercise is predicted to rescue only 15 tons from an estimated 12,000 tons that are sent to the Hinton Landfill each year. However the opportunity for profit is small compared to the ecological damage we are doing to the potential for growing plants in our urban area. We are literally shipping the future soil out of our yards and to a landfill where no one can use it. 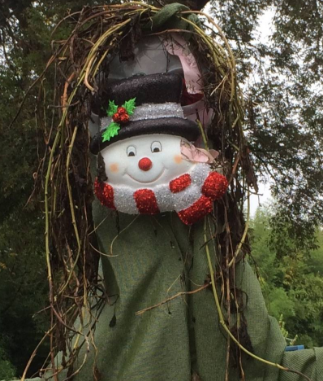 With our friendly leaf keeper now properly identified we are hoping that no one will mistake him for an "evil" spirit. Part of any well-managed system designed to span many years, should be a built-in process that allows for continuous improvement. Long-term city plans are one example of such systems that should be subject to scheduled reviews that result in tweaks to the trajectory of the recommendations. You are part of the city in which you reside. I recommend that you review your city's long-term plans and think what suggestions you might make for updating some of its goals. Following my own advice, I recently read "Envision Garland - 2030 Comprehensive Plan" that was created in March of 2012--four years ago. To minimize any additional stress on our resources such as water in our drought prone area, it is suggested to build hugelkulturs to accommodate the planting of more edibles in our parks. These types of beds, after one year of maturing, are said to require no additional nutrients or water for up to 25 years. NOTE: Perhaps we can build community by engaging residents to participate in these efforts to build hugelkulturs. To build them is labor intensive but not expensive as you use natural resources such as decaying logs and organic matter such as leaves and animal manure. It is recommended that these beds mature one year prior to planting. as a blackberry) The blackberry will be thornless and will have a trellis. Target 4: By the end of 2026 every park in Garland will have at least two edible plants in the hugelkulturs build in 2025. Target 6: By the end of 2031 all three hugelkulturs in every park in Garland will have many edible plants growing in them. These beds can also contain some low-maintenance annual edibles such as pigeon pea shrubs. These plants look like small trees, about 7 feet tall and produce edible peas. They are nitrogen fixing and an excellent choice. You can see four of them growing now in the Garland Community Garden. They are very pretty. Kale is another edible that grows well in our city as you can see at the Garland Community Garden. EXPAND THIS PLAN BY APPLYING THESE SIX TARGET GOALS TO THE LAND ON WHICH ALL SCHOOLS IN THE GARLAND ISD ARE BUILT. This would have the added benefit of teaching our future leaders the importance of proper urban land stewardship and management. Note: Thanks to the efforts of Loving Garland Green, the teachers and parents of students at Watson MST, they have a hugelkultur in their school garden that was installed in May of 2016. We might also explore the possibility of creating modified narrow (2 ft wide, 3 ft deep) hugelkulturs along some downtown south-facing city walls and growing annual vine vegetable crops vertically such as zucchini and cucumbers. GOAL: Take Actions to protect our ecology and the balance of nature in our community. It is a serious ecological mistake for our city to carry an estimated 12,000 tons of leaves to the Hinton landfill each year. Ideally leaves should remain very close to the place where they fall. Decaying leaves are nature’s way of building new soil and replacing nutrients taken from the existing soil to grow those leaves. 2) Educate people regarding the better choices they have available to them. By 2018 the Garland City website has an online tool that enables residents to assess and measure their own ecological footprint as well as that of their city. This tool would then offer suggestions for minimizing size of the ecological footprints—as individuals and as a city. Note: All cities have an ecological footprint. 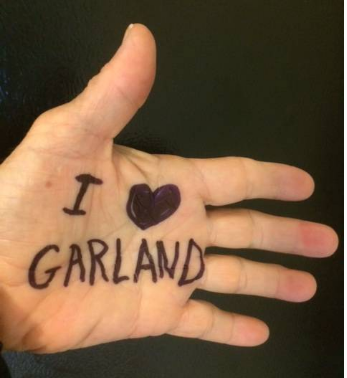 I’m not sure what the size of Garland’s footprint is or if it has been measured. If not, it should be measured and as a city we should have stated goals for its reduction as part of our long-range plan.